Rewind five years; amid the period of heavyweight history dominated by Lennox Lewis and Vitali Klitschko, with towering contenders like Jameel McCline, Wladimir Klitschko, Michael Grant, Henry Akinwande, Hasim Rahman, Nicolay Valuev and Andrew Golota and it was increasingly easy to dismiss the chances of bygone greats like Rocky Marciano and Gene Tunney, or even through to Joe Frazier, emerging victorious in any fantasy match-up. With weight advantages in these fantasy contests spiralling toward 100lbs and a yard of reach from their 6 and half foot frames, the modern day heavy simply seemed a different athlete to their predecessors. How could Marciano hope to escape the strength of Lennox Lewis? 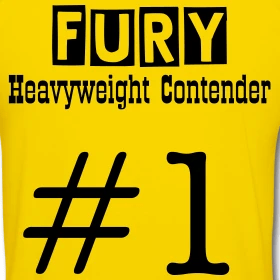 Strength Glen McCory, a fighter with an optimum weight closer to Marciano and Tunney’s as a former Cruiserweight world champion (190lbs), once compared to “wearing a concrete over-coat”. Would Tunney’s science really be enough to prevail in the face of such seemingly insurmountable physical disadvantages as those he would encounter were he to face a fighter like Andrew Golota or Wladimir Klitschko? Could a case even be made for 200lb Joe Louis, at 6’3, and a murderous puncher, to remain competitive given the weight and reach deficits he would need to overcome in conflict with Lennox Lewis or granite-chinned Ukrainian Vitali Klitschko? But something changed. It took time, but the presumed advantage of weight and height was exposed. First by Roy Jones Jnr. in victory over John Ruiz. Although not the biggest of his contemporaries Ruiz was, and is, a solid 230 pound heavyweight. He had no answer to Jones’ speed and precision. It appeared to encourage the smaller fighters in the division. James Toney stepped up and overcame naturally bigger men using feints and superior technique. In the lighter divisions, Bernard Hopkins proved technique and preparation are more than a match for the size advantage enjoyed by Antonio Tarver and latterly, Floyd Mayweather showed in beating Oscar DeLaHoya and Carlos Baldomir that speed kills. The culmination of this revolution was the ousting of Nicolay Valuev as the WBA Heavyweight title holder, the largest man to ever hold a version of the world championship at over 300lbs and close to 7ft tall. He was thoroughly outmanoeuvred by Ruslan Chagaev, a 6ft counter-puncher who gave away 100lbs in weight and a postcode or two in reach. Proving, beyond reasonable doubt, that size could be as much a disadvantage as it could an advantage. Modern day heavyweights may be bigger, but in most cases their inflated frames lead to a deflated reservoir of stamina and while that was less of a factor in slow paced encounters with each other – the introduction of more mobile opponents left them exposed. In between, and because of the lack of activity and stamina demonstrated by the likes of Rahman and co, I’ve grown to hold a greater appreciation of the sepia and black and white heroes of yesteryear. Would Rahman really have the mental fortitude to repel a Marciano or Dempsey, bristling with hunger, menace and intent? Both fearsome punchers, Marciano and Dempsey were accustomed to combat before the niceties of ‘Standing 8’ counts were implemented and boasted stamina reserves hewn from the coal-face of combat. Not the falsehoods of 14 week ‘camps’. Dempsey and Marciano would have savaged immobile targets like Rahman and McCline. Golota v Briggs in Poland? You see once you introduce Holyfield you change the whole evaluation, because he was shorter, squater and as rough as any of his predeccesors. Holyfield could have hung in any era, whether it be with Dempsey or Louis, Frazier and Ali and of course Lewis and Tyson with whom he did tangle. Holyfield remains #5 or #6 on my list of heavyweights. What a lovely tale that ESPN story is. Must read stuff. 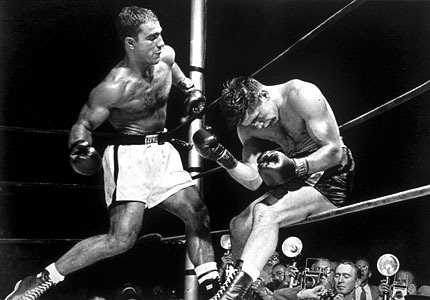 As for Marciano in the modern day heavyweight division, I really don’t see anyone around who could handle him. Fair enough, he was little, but I suspect with his hard head and determination, he would simply have waded through many of today’s cumbersome, static heavyweights. They simply wouldn’t have been able to keep him off, or live with his pace for 12 rounds. The way to beat the Rock would have been to show him angles and movement, but there’s nobody around who can do that for the full distance at his pace. You had it about right when you said the modern day pugs would be “savaged”. Against a peak Holyfield, though? Now there’s a fantasy fight worth a thought.